Sir Muhammad Iqbal (Urdu: محمد اقبال‎) (November 9, 1877 – April 21, 1938), also known as Allama Iqbal (علامہ اقبال), was a philosopher, poet and politician in British India who is widely regarded as having inspired the Pakistan Movement. He is considered one of the most important figures in Urdu literature with literary work in both the Urdu and Persian languages. Iqbal is admired as a prominent classical poet by Pakistani, Indian, Iranian, and other international scholars of literature. Though Iqbal is best known as an eminent poet, he is also a highly acclaimed “Muslim philosophical thinker of modern times”. His first poetry book, Asrar-e-Khudi, appeared in the Persian language in 1915, and other books of poetry include Rumuz-i-Bekhudi, Payam-i-Mashriq and Zabur-i-Ajam. Amongst these his best known Urdu works are Bang-i-Dara, Bal-i-Jibril, Zarb-i Kalim and a part of Armughan-e-Hijaz. 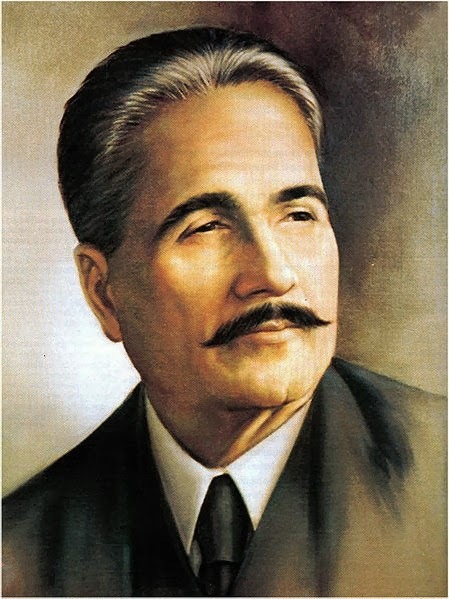 In Iran and Afghanistan, he is famous as Iqbāl-e Lāhorī (اقبال لاهوری‎) (Iqbal of Lahore), and he is most appreciated for his Persian work. Along with his Urdu and Persian poetry, his various Urdu and English lectures and letters have been very influential in cultural, social, religious and political disputes over the years. In 1922, he was knighted by King George V, giving him the title “Sir”. While studying law and philosophy in England, Iqbal became a member of the London branch of the All India Muslim League. Later, in one of his most famous speeches, Iqbal pushed for the creation of a Muslim state in Northwest India. This took place in his presidential speech in the League’s December 1930 session. In much of Southern Asia and Urdu speaking world, Iqbal is regarded as the Shair-e-Mashriq (شاعر مشرق, “Poet of the East”). He is also called Muffakir-e-Pakistan (مفکر پاکستان, “The Thinker of Pakistan”) and Hakeem-ul-Ummat (حکیم الامت, “The Sage of theUmmah”). The Pakistan government officially named him a “national poet”. His birthday Yōm-e Welādat-e Muḥammad Iqbāl (یوم ولادت محمد اقبال) or (Iqbal Day) is a public holiday in Pakistan. In India he is also remembered as the author of the popular song Saare Jahaan Se Achcha. Iqbal was born in Sialkot on 9 November 1877 within the Punjab Province of British India (now in Pakistan). His grandparents were Kashmiri Pandits, the Brahmins of the Sapruclan from Kashmir who converted to Islam. In the 19th century, when Sikhs were taking over rule of Kashmir, his grandfather’s family migrated to Punjab. Iqbal often mentioned and commemorated about his Kashmiri Pandit Brahmin lineage in his writings. Iqbal’s father, Sheikh Noor Muhammad, was a tailor, not formally educated but a religious man. Iqbal’s mother Imam Bibi was a polite and humble woman who helped the poor and solved the problems of neighbours. She died on 9 November 1914 in Sialkot. Iqbal loved his mother, and on her death he expressed his feelings of pathos in a poetic form elegy. Iqbal was four years old when he was admitted to the mosque for learning the Qur’an, he learned the Arabic language from his teacher Syed Mir Hassan, the head of the madrassa and professor of Arabic language at Scotch Mission College in Sialkot, where Iqbal completed matriculation in 1893. He received Intermediate with the Faculty of Arts diploma from Murray College Sialkot in 1895. The same year he enrolled Government College Lahore where he qualified for Bachelor of Arts in philosophy, English literature and Arabic as his subjects from Government College Lahore in 1897, and won the Khan Bahadurddin F.S. Jalaluddin medal as he took higher numbers in Arabic class. In 1899, he received Masters of Arts degree from the same college and had the first place in Punjab University, Lahore. Iqbal had married three times, in 1895 while studying Bachelor of Arts he had his first marriage with Karim Bibi, the daughter of a Gujaratiphysician Khan Bahadur Ata Muhammad Khan, through an arranged marriage. They had daughter Miraj Begum and son Aftab Iqbal. Later Iqbal’s second marriage was with Sardar Begum mother of Javid Iqbal and third marriage with Mukhtar Begum in December 1914. Iqbal was influenced by the teachings of Sir Thomas Arnold, his philosophy teacher at Government college Lahore, Arnold’s teachings determined Iqbal to pursue higher education in the West. In 1905, he traveled to England for his higher education. Iqbal qualified for a scholarship from Trinity College in Cambridge and obtained Bachelor of Arts in 1906, and in the same year he was called to the bar as a barrister from Lincoln’s Inn. In 1907, Iqbal moved to Germany to study doctorate and earned PhD degree from the Ludwig Maximilian University, Munich in 1908. Working under the guidance of Friedrich Hommel, Iqbal published his doctoral thesis in 1908 entitled: The Development of Metaphysics in Persia. During Iqbal’s stay in Heidelberg, Germany in 1907 his German teacher Emma Wegenast taught him about Goethe’s Faust, Heine andNietzsche. During his study in Europe, Iqbal began to write poetry in Persian. He prioritized it because he believed he had found an easy way to express his thoughts. He would write continuously in Persian throughout his life. Iqbal, after completing his Master of Arts degree in 1899, initiated his career as a reader of Arabic at Oriental College and shortly was selected as a junior professor of philosophy at Government College Lahore, where he had also been a student, and worked there until he left for England in 1905. In 1908, Iqbal returned from England and joined the same college again as a professor of philosophy and English literature. At the same period Iqbal began practicing law at Chief Court Lahore, but soon Iqbal quit law practice, and devoted himself in literary works and became an active member of Anjuman-e-Himayat-e-Islam. In 1919, he became the general secretary of the same organisation. Iqbal’s thoughts in his work primarily focus on the spiritual direction and development of human society, centered around experiences from his travels and stays in Western Europe and the Middle East. He was profoundly influenced by Western philosophers such as Friedrich Nietzsche, Henri Bergson and Goethe. The poetry and philosophy of Mawlana Rumi bore the deepest influence on Iqbal’s mind. Deeply grounded in religion since childhood, Iqbal began intensely concentrating on the study of Islam, the culture and history of Islamic civilization and its political future, while embracing Rumi as “his guide”. Iqbal would feature Rumi in the role of guide in many of his poems. Iqbal’s works focus on reminding his readers of the past glories of Islamic civilization, and delivering the message of a pure, spiritual focus on Islam as a source for sociopolitical liberation and greatness. Iqbal denounced political divisions within and amongst Muslim nations, and frequently alluded to and spoke in terms of the global Muslim community or the Ummah. Iqbal poetry has been translated into many European languages, at the time when his work was famous during the early part of the 20th century. Iqbal’s Asrar-i-Khudi and Javed Nama were translated into English by R A Nicholson and A J Arberry respectively. The tomb of Muhammad Iqbal at the entrance of the Badshahi Mosque inLahore. In 1933, after returning from a trip to Spain and Afghanistan, Iqbal had suffered from a mysterious throat illness. He spent his final years helping Chaudhry Niaz Ali Khan to establish the Dar ul Islam Trust Institute at Jamalpur estate near Pathankot, where studies in classical Islam and contemporary social science were plan to be subsidised, and Iqbal also advocated the demand for an independent Muslim state. Iqbal ceased practising law in 1934 and was granted pension by the Nawab of Bhopal. In his final years he frequently visited the Dargah of famous Sufi Hazrat Ali Hujwiri in Lahore for spiritual guidance. After suffering for months from his illness, Iqbal died in Lahore on 21 April 1938. His tomb is located in Hazuri Bagh, the enclosed garden between the entrance of the Badshahi Mosque and the Lahore Fort, and official guards are provided by the Government of Pakistan. A night view of the tomb. Iqbal is commemorated widely in Pakistan, where he is regarded as the ideological founder of the state. HisTarana-e-Hind is a song that is widely used in India as a patriotic song speaking of communal harmony. His birthday is annually commemorated in Pakistan as Iqbal Day, a national holiday. Iqbal is the namesake of many public institutions, including the Allama Iqbal Campus Punjab University in Lahore, the Allama Iqbal Medical College in Lahore, Iqbal Stadium in Faisalabad, Allama Iqbal Open University in Pakistan, the Allama Iqbal International Airport in Lahore, the Allama Iqbal hall in Nishtar Medical College in Multan and Gulshan-e-Iqbal Town in Karachi and Allama Iqbal Hall at AMU, India. The government and public organizations have sponsored the establishment of educational institutions, colleges and schools dedicated to Iqbal, and have established the Iqbal Academy Pakistan to research, teach and preserve the works, literature and philosophy of Iqbal. Allama Iqbal Stamps Society established for the promotion of Iqbaliyat inphilately and in other hobbies. His son Javid Iqbal has served as a justice on the Supreme Court of Pakistan. Javaid Manzil was the last residence of Allama Iqbal. While dividing his time between law practice and poetry, Iqbal had remained active in the Muslim League. He did not support Indian involvement in World War I and remained in close touch with Muslim political leaders such as Mohammad Ali Jouhar and Muhammad Ali Jinnah. He was a critic of the mainstream Indian National Congress, which he regarded as dominated by Hindus and was disappointed with the League when during the 1920s, it was absorbed in factional divides between the pro-British group led by Sir Muhammad Shafi and the centrist group led by Jinnah. (L to R): M. Iqbal (third), Syed Zafarul Hasan(sixth) at Aligarh Muslim University. In November 1926, with the encouragement of friends and supporters, Iqbal contested for a seat in the Punjab Legislative Assembly from the Muslim district of Lahore, and defeated his opponent by a margin of 3,177 votes. He supported the constitutional proposals presented by Jinnah with the aim of guaranteeing Muslim political rights and influence in a coalition with the Congress, and worked with the Aga Khan and other Muslim leaders to mend the factional divisions and achieve unity in the Muslim League. While in Lahore he was a friend of Abdul Sattar Ranjoor. Iqbal’s six English lectures were published first from Lahore in 1930 and then by Oxford University press in 1934 in a book titled The Reconstruction of Religious Thought in Islam. Which were read at Madras, Hyderabad and Aligarh. These lectures dwell on the role of Islam as a religion as well as a political and legal philosophy in the modern age. In these lectures Iqbal firmly rejects the political attitudes and conduct of Muslim politicians, whom he saw as morally misguided, attached to power and without any standing with Muslim masses. Iqbal expressed fears that not only would secularism weaken the spiritual foundations of Islam and Muslim society, but that India’s Hindu-majority population would crowd out Muslim heritage, culture and political influence. In his travels to Egypt, Afghanistan, Iran and Turkey, he promoted ideas of greater Islamic political co-operation and unity, calling for the shedding of nationalist differences. He also speculated on different political arrangements to guarantee Muslim political power; in a dialogue with Dr. B. R. Ambedkar, Iqbal expressed his desire to see Indian provinces as autonomous units under the direct control of the British government and with no central Indian government. He envisaged autonomous Muslim provinces in India. Under one Indian union he feared for Muslims, who would suffer in many respects especially with regard to their existentially separate entity as Muslims. “I would like to see the Punjab, North-West Frontier Province, Sind and Baluchistan amalgamated into a single state. Self-government within the British Empire, or without the British Empire, the formation of a consolidated Northwest Indian Muslim state appears to me to be the final destiny of the Muslims, at least of Northwest India. In his speech, Iqbal emphasised that unlike Christianity, Islam came with “legal concepts” with “civic significance,” with its “religious ideals” considered as inseparable from social order: “therefore, the construction of a policy on national lines, if it means a displacement of the Islamic principle of solidarity, is simply unthinkable to a Muslim.” Iqbal thus stressed not only the need for the political unity of Muslim communities, but the undesirability of blending the Muslim population into a wider society not based on Islamic principles. He thus became the first politician to articulate what would become known as the Two-Nation Theory—that Muslims are a distinct nation and thus deserve political independence from other regions and communities of India. However, he would not elucidate or specify if his ideal Islamic state would construe a theocracy, even as he rejected secularism and nationalism. The latter part of Iqbal’s life was concentrated on political activity. He would travel across Europe and West Asia to garner political and financial support for the League, and he reiterated his ideas in his 1932 address, and during the Third round-Table Conference, he opposed the Congress and proposals for transfer of power without considerable autonomy or independence for Muslim provinces. He would serve as president of the Punjab Muslim League, and would deliver speeches and publish articles in an attempt to rally Muslims across India as a single political entity. Iqbal consistently criticised feudal classes in Punjab as well as Muslim politicians averse to the League. Many unnoticed account of Iqbal’s frustration toward Congress leadership were also pivotal of visioning the two nation theory. Iqbal was the first patron of the historical, political, religious, cultural journal of Muslims of British India. This journal played an important part in the Pakistan movement. The name of this journal is The Journal Tolu-e-Islam. In 1935, according to his instructions, Syed Nazeer Niaziinitiated and .ed, a journal Tolu-e-Islam named after the famous poem of Iqbal, Tulu’i Islam. He also dedicated the first .ion of this journal to Iqbal. For a long time Iqbal wanted a journal to propagate his ideas and the aims and objective of Muslim league. It was Syed Nazeer Niazi, a close friend of his and a regular visitor to him during his last two years, who started this journal. Later on, this journal was continued by Ghulam Ahmed Pervez, who had already contributed many articles in the early editions of this journal. Iqbal’s poetic works are written primarily in Persian rather than Urdu. Among his 12,000 verses of poetry, about 7,000 verses are in Persian. In 1915, he published his first collection of poetry, the Asrar-e-Khudi (Secrets of the Self) in Persian. The poems emphasise the spirit and self from a religious, spiritual perspective. Many critics have called this Iqbal’s finest poetic work In Asrar-e-Khudi, Iqbal explains his philosophy of “Khudi,” or “Self.” Iqbal’s use of the term “Khudi” is synonymous with the word “Rooh” mentioned in the Quran. “Rooh” is that divine spark which is present in every human being, and was present in Adam, for which God ordered all of the angels to prostrate in front of Adam. One has to make a great journey of transformation to realise that divine spark which Iqbal calls “Khudi”. The same concept was used by Farid ud Din Attar in his “Mantaq-ul-Tair”. He proves by various means that the whole universe obeys the will of the “Self.” Iqbal condemns self-destruction. For him, the aim of life is self-realization and self-knowledge. He charts the stages through which the “Self” has to pass before finally arriving at its point of perfection, enabling the knower of the “Self” to become a vice-regent of God. In his Rumuz-e-Bekhudi (Hints of Selflessness), Iqbal seeks to prove the Islamic way of life is the best code of conduct for a nation’s viability. A person must keep his individual characteristics intact, but once this is achieved he should sacrifice his personal ambitions for the needs of the nation. Man cannot realise the “Self” outside of society. Also in Persian and published in 1917, this group of poems has as its main themes the ideal community, Islamic ethical and social principles, and the relationship between the individual and society. Although he is true throughout to Islam, Iqbal also recognises the positive analogous aspects of other religions. The Rumuz-e-Bekhudi complements the emphasis on the self in the Asrar-e-Khudi and the two collections are often put in the same volume under the title Asrar-e-Rumuz (Hinting Secrets). It is addressed to the world’s Muslims. Iqbal’s 1924 publication, the Payam-e-Mashriq (The Message of the East) is closely connected to the West-östlicher Diwan by the famous German poet Goethe. Goethe bemoans the West having become too materialistic in outlook, and expects the East will provide a message of hope to resuscitate spiritual values. Iqbal styles his work as a reminder to the West of the importance of morality, religion and civilisation by underlining the need for cultivating feeling, ardour and dynamism. He explains that an individual can never aspire to higher dimensions unless he learns of the nature of spirituality. In his first visit to Afghanistan, he presented his book “Payam-e Mashreq” to King Amanullah Khan in which he admired the liberal movements of Afghanistan against the British Empire. In 1933, he was officially invited to Afghanistan to join the meetings regarding the establishment of Kabul University. The Zabur-e-Ajam (Persian Psalms), published in 1927, includes the poems Gulshan-e-Raz-e-Jadeed (Garden of New Secrets) and Bandagi Nama (Book of Slavery). In Gulshan-e-Raz-e-Jadeed, Iqbal first poses questions, then answers them with the help of ancient and modern insight, showing how it affects and concerns the world of action. Bandagi Nama denounces slavery by attempting to explain the spirit behind the fine arts of enslaved societies. Here as in other books, Iqbal insists on remembering the past, doing well in the present and preparing for the future, while emphasising love, enthusiasm and energy to fulfill the ideal life. Iqbal’s Bang-e-Dara (The Call of the Marching Bell), the first collection of Urdu poetry, was published in 1924. It was written in three distinct phases of his life. The poems he wrote up to 1905—(the year Iqbal left for England) reflects patriotism and imagery of nature, that includes the Tarana-e-Hind (The song of India), and another poem Tarana-e-Milli (The song of the Community). The second set of poems from 1905—1908; when Iqbal studied in Europe and dwell upon the nature of European society about whom he emphasised had lost spiritual and religious values, these inspired Iqbal to write poems on the historical and cultural heritage of Islam and Muslim community, with the global perspective. Iqbal urges the entire Muslim community, addressed as the Ummah to define personal, social and political existence by the values and teachings of Islam. Iqbal work mainly in Persian for a predominant period of his career and after 1930, his works were mainly in Urdu. The works of this period were often specifically directed at the Muslim masses of India, with an even stronger emphasis on Islam and Muslim spiritual and political reawakening. Published in 1935, the Bal-e-Jibril (Wings of Gabriel) is considered by many critics as the finest of Iqbal’s Urdu poetry, and was inspired by his visit to Spain, where he visited the monuments and legacy of the kingdom of the Moors. It consists of ghazals, poems, quatrains, epigrams and carries a strong sense of religious passion. The Pas Cheh Bayed Kard ai Aqwam-e-Sharq (What are we to do, O Nations of the East?) includes the poem Musafir (Traveler). Again, Iqbal depicts Rumi as a character and an exposition of the mysteries of Islamic laws and Sufi perceptions is given. Iqbal laments the dissension and disunity among the Indian Muslims as well as Muslim nations. Musafir is an account of one of Iqbal’s journeys to Afghanistan, in which the Pashtun people are counselled to learn the “secret of Islam” and to “build up the self” within themselves.Iqbal’s final work was the Armughan-e-Hijaz (The Gift of Hijaz), published posthumously in 1938. The first part contains quatrains in Persian, and the second part contains some poems and epigrams in Urdu. The Persian quatrains convey the impression as though the poet is travelling through the Hijaz in his imagination. Profundity of ideas and intensity of passion are the salient features of these short poems. Iqbal also wrote two books on the topic of The Development of Metaphysics in Persia and The Reconstruction of Religious Thought in Islam and many letters in English language, besides his Urdu and Persian literary works. In which, he revealed his thoughts regarding Persian ideology and Islamic Sufism – in particular, his beliefs that Islamic Sufism activates the searching soul to a superior perception of life. He also discussed philosophy, God and the meaning of prayer, human spirit and Muslim culture, as well as other political, social and religious problems. Iqbal was invited to Cambridge to participate in the conference in 1931, where he expressed his views to students and other audience. “I would like to offer a few pieces of advice to the youngmen who are at present studying at Cambridge. … I advise you to guard against atheism and materialism. The biggest blunder made by Europe was the separation of Church and State. This deprived their culture of moral soul and diverted it to the atheistic materialism. I had twenty-five years ago seen through the drawbacks of this civilization and therefore had made some prophecies. They had been delivered by my tongue although I did not quite understand them. This happened in 1907…. After six or seven years, my prophecies came true, word by word. The European war of 1914 was an outcome of the aforesaid mistakes made by the European nations in the separation of the Church and the State”. Iqbal has been recognised and quoted as “Poet of the East” by academics and institutions and media. The Vice Chancellor, Quaid-e-Azam University, Dr. Masoom Yasinzai described in a seminar as chief guest addressing to distinguished gathering of educationists and intellectuals,that Iqbal is not a poet of the East only, actually he is a universal poet. Moreover, Iqbal is not restricted to any specific segment of the world community but he is for the entire humanity. Iqbal’s revolutionary works through his poetry awakened the Muslims of the subcontinent. Iqbal was confident that the Muslims had long been suppressed by the colonial enlargement and growth of the West. In this concept Iqbal is recognised as the “Poet of the East”. So to conclude, let me cite Annemarie Schimmel in Gabriel’s Wing who lauds Iqbal’s ‘unique way of weaving a grand tapestry of thought from eastern and western yarns’ (p. xv), a creative activity which, to cite my own volume Revisioning Iqbal, endows Muhammad Iqbal with the stature of a “universalist poet” and thinker whose principal aim was to explore mitigating alternative discourses with a view to constructing a bridge between the ‘East’ and the ‘West’ . Urdu world is very familiar Iqbal as the “Poet of the East”. Iqbal is also called Muffakir-e-Pakistan (مفکر پاکستان, “The Thinker of Pakistan”) andHakeem-ul-Ummat (حکیم الامت, “The Sage of the Ummah”). The Pakistan government officially named him a “national poet”. Name plate of a street Iqbal-Ufer, Heidelberg, Germany, honoured in the name of Iqbal. Iqbal is great for his passionate condemnation of weak will and passiveness, his angry protest against inequality, discrimination and oppression in all forms i.e., economic, social, political, national, racial, religious, etc., his preaching of optimism, an active attitude towards life and man’s high purpose in the world, in a word, he is great for his assertion of the noble ideals and principles of humanism, democracy, peace and friendship among peoples.